For Walt Disney's sixteenth full-length animated feature, he wanted to try something very ambitious. The concept for Sleeping Beauty was that it would look like a moving piece of art. Each frame would be worthy of being displayed in a gallery. Walt also decided to film it in the new Technirama70 widescreen, a format that was both wider and larger than CinemaScope. As a result, all of the paper the animators used had to be bigger as well. 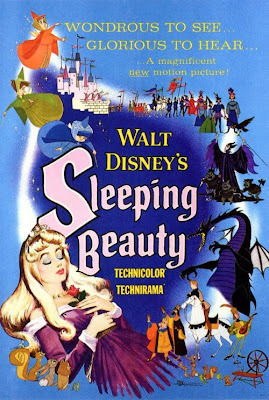 Story development on Sleeping Beauty started in 1951, meaning that in total it took 8 years to make. Animation alone took 6 years because of the level of detail in each frame. The art design was done by Eyvind Earle, who made a lot of contributions to the design of Lady and the Tramp. Walt originally had his team of songwriters create songs for the film, but in the end he decided to use the music from Tchaikovsky's ballet and put words to his pre-existing music. The voice of Aurora was Mary Costa, a young opera singer who went on to have a great opera career. Maleficent was voiced by Eleanor Audley, a great TV actress who was the narrator in Cinderella and the voice of Madame Leota in the classic Disney park attraction, The Haunted Mansion. Verna Felton plays Flora, the good fairy and she also played the Fairy Godmother in Cinderella. Barbara Luddy plays Merriwether and she was also the voice of Lady in Lady and the Tramp. All of the sound was recorded in Germany where the best recording equipment was. Like most Disney fairy tales, Sleeping Beauty begins with the opening of a book. Once upon a time, a princess named Aurora was born and betrothed to a neighboring kingdom's Prince Philip. But the evil fairy, Maleficent, angered by the fact that she wasn't invited to the celebration, places a curse on the baby that before sunset on her sixteenth birthday, she will prick her finger on a spinning wheel and die. Unable to undo her spell, one of the three good fairies makes it so that she will sleep instead of die, but the only way for her to awaken is by true loves kiss. To keep Aurora hidden from Maleficent, the three fairies disguise themselves as peasant women and raise Aurora in the woods. On the eve of her sixteenth birthday, she meets a man in the woods and falls in love with him. When she finds out that she is a betrothed princess, she is upset. And as she is returned to the castle, Maleficent finds her and Aurora pricks her finger. Meanwhile Prince Philip has been captured by Maleficent. The three fairies help him escape and give him a sword and shield so that he can defeat Maleficent, who has placed a forest of thorns around the castle and turned herself into a fire breathing dragon. Good triumphs over evil and Aurora is surprised to awaken to a kiss from the man she met in the woods, who is her betrothed Prince Philip. Walt Disney's Sleeping Beauty premiered on January 29th, 1959. At $6 million, it was the most expensive animated film ever made. Sadly, it earned $5.8 million, less than what it cost to make, meaning Disney lost money on it. Critics were unkind to the film, calling it unimaginative and too similar to previous Disney films. Perhaps in response to the lack of critical praise, audiences didn't flock to see Walt Disney's latest animated feature. Nowadays, it is hard to see what critics had a problem with in Sleeping Beauty. It is a beautiful film with wonderful characters, romantic music and lots of excitement. Thankfully, time was very kind to the film. It was re-released five times in theaters and each time it gained a new audience that was able to appreciate the grandeur of it. Today, it is one of the Walt Disney Company's most prominent animated classics and is included in their Diamond Edition home video line, which celebrates their fifteen best selling animated films. Sadly, Sleeping Beauty was the end of an era. It was the last time that Disney would pour a lot of money into an animated feature for many years to come. In addition, it was the last film to be hand inked by the legendary ink and paint department. The next animated film, 101 Dalmatians, was the first to use the new Xerox process in which the animator's drawings would be directly scanned onto celluloid, losing the fluid feel that the hand-inked films had. Today, the legacy of Sleeping Beauty is huge with the Disney company. In 1955, the castle that was the centerpiece of Disneyland was named Sleeping Beauty Castle in honor of the in-development film. Today, Princess Aurora owns real estate at Disneyland Paris and Hong Kong Disneyland as well. An attraction based on the film will be included in Walt Disney World's Fantasyland expansion at the Magic Kingdom. And thanks to the ever popular Disney Princess franchise, Aurora and other characters from Sleeping Beauty are among the most heavily merchandised Disney characters. Sleeping Beauty is currently available on Blu-Ray as a Diamond Edition. The film has been fully restored and is presented in 2.55:1 widescreen, which is wider than its original 2.35:1 theatrical aspect ratio because it shows the full animated image. However, this single disc release only adds new bonus features to promote the film Maleficent. I recommend the previous Blu-ray from 2008, which featured the exact same transfer but had more bonus features. That 2-disc sets contains a making-of documentary in addition to many great bonus features and a CineExplore picture commentary. The Platinum Edition of Sleeping Beauty was put back into the vault on January 31st, 2010. The stunning artwork makes this film one of my Disney favourites. I can't understand why, after such a legacy of fantastic animated movies, this one didn't even break even at the box office. Still, it has reached its deserved status as a Disney classic today! Sleeping Beauty is one of the most beautiful films ever made.